The young daughters of President-Elect Barack Obama will be eating lunches that are healthy and organic at their new school Sidwell-Friends. The lunch menu should be the envy of school cafeterias nationwide. Not only is the food nutritious, it’s stuff kids will actually eat and enjoy. The Obamas are known for eating a lean diet, so it’s possible the quality of food their daughters would be served during the day played a part in their decision. Hopefully other schools across the country will take a queue from the lunch menu of the new First Children and work toward incorporating much healthier school lunches, rather than the processed, sodium-rich foods currently being served. 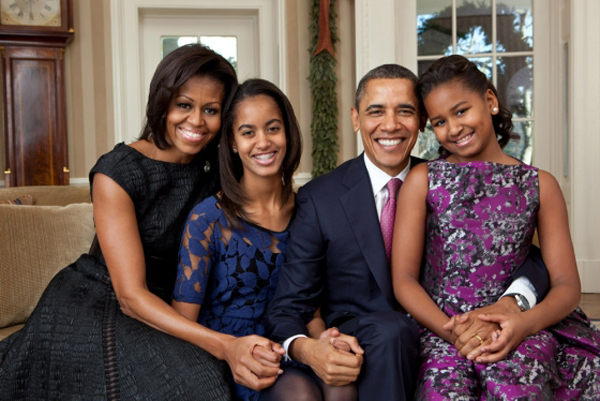 Official Obama family photo via WhiteHouse.gov. thanx i really appreciate you telling us what sasha and malia’s lunch menu is, im pleased to see that it was the top news story over pirates in somalia.